Our research work has us imaging open star cluster M23 each clear night for as long as the cluster is visible to us all summer long every summer. With M23 situated very near the ecliptic, asteroids visit the field now and then. Since asteroids move relative to the stars and the telescope is tracking the stars, an asteroid will appear as a streak (= linear structure) against the stellar background in a sufficiently long exposure. The above image is from July 10, 2005 and is the sum of many short exposures so that the effective total time from beginning to end of the exposure is a few hours. An asteroid can be seen clearly as a bright streak near the upper center of the frame. It was our good fortune that July 9, 2005 was also clear and we saw this same asteroid on that night, shifted a little.The image above covers about a tenth of a degree by a tenth of a degree (six arcminutes by six arcminutes). A little detective work revealed that this asteroid was 206 Hersilia. In 2007 as part of his senior project Victor Ogunjimi used these images to calculate the orbital elements of Hersilia. He also searched for possible rotation of the asteroid. If the asteroid is not spherical, then as it rotates the amount of light reflected toward earth will vary and we will see the asteroid getting brighter and dimmer. Victor found that the light curve of the asteroid was consistent with a rotational period of about 8 hours, consistent with the accepted period. However, we would need more data to be certain that the variations in brightness we observed were not an artifact of frame normalization. For a nice discussion of asteroid rotation, visit John E. Hoot's page on the topic. 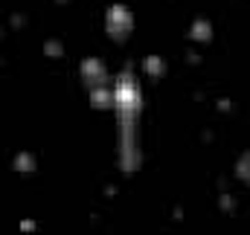 We sometimes see other, fainter asteroids within the field, an example of which is shown below. 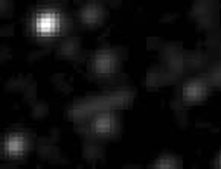 The image on the left below is from June 1, 2006 and covers a field of view only about 18 percent as large as the field of the Hersilia image above. The image is a sum of short images covering about 45 minutes. The image on the right below is from August 9, 2008. The field of view of this image spanning about an hour is approximately 4 arcminutes on a side. 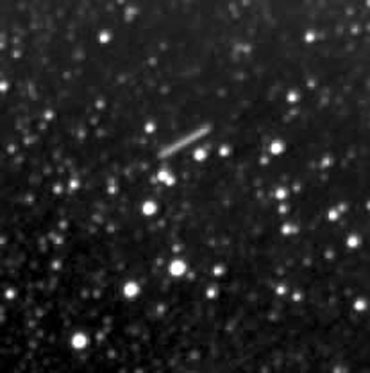 A way cool asteroid strolling through the field of M23. We have, however, not undertaken a thorough search for these objects.In addition to the asteroids, we see the long, bright tracks of satellites. There must be the occasional object burning up in our atmosphere (a meteor) as well. I am hoping that some ambitious student decides that it would make a good senior project to do a complete search of our data for all the linear tracks that can be found and then sets about determining the nature of the objects giving rise to those tracks.